The night after I made soup and the amazing pizza dough discovery, I made this breakfast-for-dinner meal. While Cornelius didn’t think much of the soup for dinner, this meal earned a big gold star. He loved it. 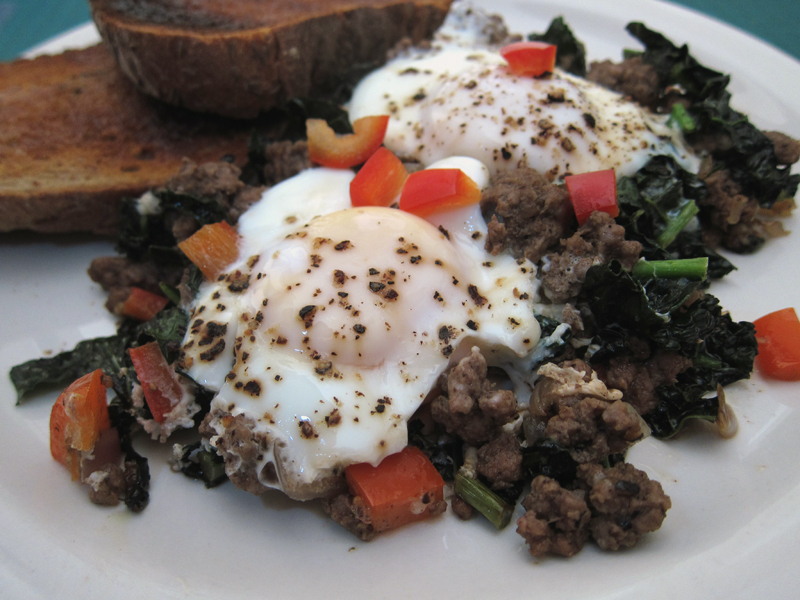 Ground beef, runny eggs and toast, plus a heck of a lot of kale to keep things on the up and up. This recipe comes from the Cast Iron Skillet Cookbook which was generously sent to me by Sasquatch Books. If you think the cast iron skillet is the best pan in your kitchen (I own 7 of them myself – just found another in the sink! I own 8!) then you might want to check this one out. The recipe is apparently a San Francisco specialty and it’s diner food at it’s comforting best. 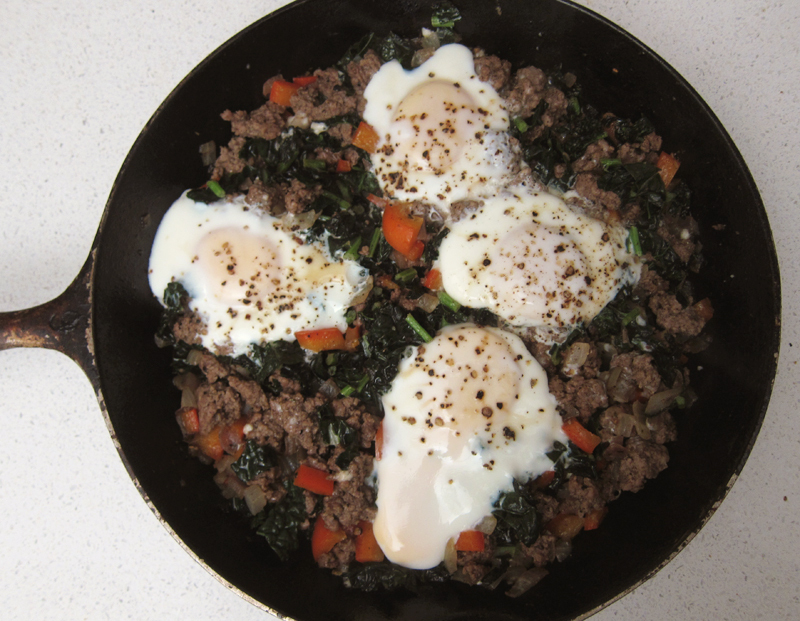 I used good local organic extra-lean beef and eggs and kale, so it felt a notch above a greasy diner breakfast. Spinach is the traditional green used in this dish, but I forgot to pick some up at the store but I had some lovely dinosaur kale wanting to be used instead. It worked beautifully. It’s not the most glamourous meal, but what it lacks in looks, it makes up in deliciousness. It’s just plain good. 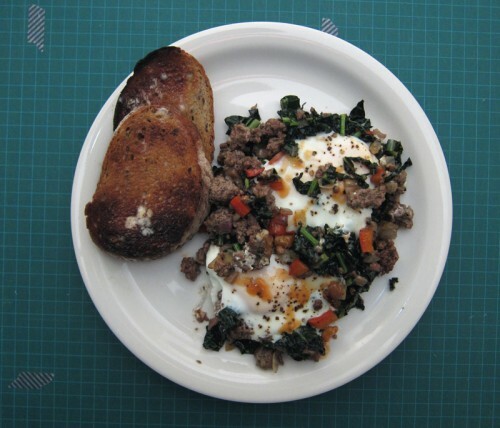 This is a simple but tasty breakfast or dinner dish and if you wanted something with more punch, substitute in some of your favourite fresh Italian sausage instead of ground beef. In a 10-inch cast iron skillet, melt butter over medium heat. Add in onion and oregano, sautéing until fragrant and slightly soft. Crumble in the ground beef along with a good grind of black pepper and a pinch of kosher salt. Stir often until the meat is evenly brown. Add in the red pepper and kale, letting the kale wilt. Crack eggs evenly spaced into the pan over top of the kale/beef mixture. Cook and cover for 5 minutes, or until the whites have just set and the yolks have just begun to set. Serve with freshly grated Parmesan and fresh red pepper dice sprinkled over top along with a few drops of your favourite hot sauce. Buttered toast is a must. 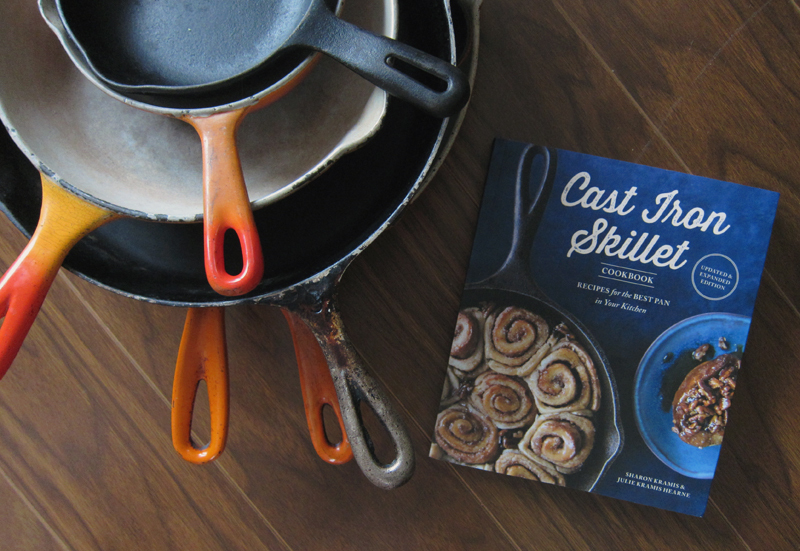 You know I love my cast iron skillet, so I might need that cookbook 🙂 I love easy and hearty comfort food like this when it’s cold out! Marc gets pretty excited whenever we have beef for dinner, too, ha. 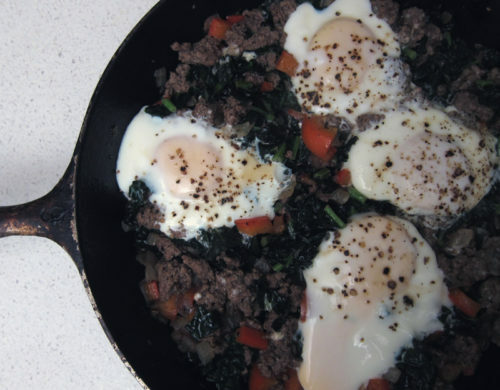 I love any meal that can be whipped up in a cast iron skillet! Nicole, it’s a good cookbook and this kind of food is total man food. Definitely. OK this is so funny to see – I grew up in the town where the diner was located that originated Stockton Joe’s. This little greasy spoon hole in the wall and everything was served in red plastic baskets with paper liners. When we moved away from CA years ago, my mom nabbed the recipe for this and we’ve been making it for years in our family. The one thing I noticed is missing though from the one you posted is nutmeg. A little tiny sprinkle of nutmeg really kicks it up in the flavor arena! Stephany, ooooh, that sounds good. Next time, I’ll toss in a little bit of nutmeg. Thanks for sharing!